Absolutely Stunning Peacock Christmas Wreath. Measures 28"+ and 10" Deep. 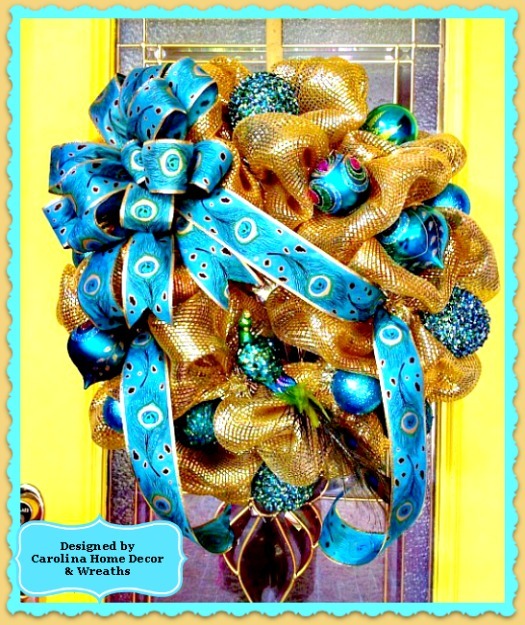 Made of Premium Shimmering Gold Deco Mesh with Large Turquoise Peacock Bow Edged in Gold with Tails. Numerous Coordinating Ornaments. Features Peacock with Long Feathered Tail as Centerpiece. Reflects Beautiful Colors in the Sunlight!